Launching rockets into outer space has never been easy – there’s a reason it’s called rocket science. Occasionally things go wrong, often in testing, sometimes on actual launches. Rockets may misbehave by not going where they should go or even refuse to work altogether and simply blow up – that’s their nature and that’s what happened yesterday with Orbital Science’s third cargo flight to the International Space Station. 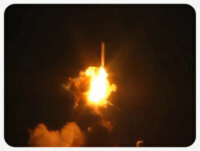 The Antares rocket, all 40 meters of it, first appeared to launch normally, but then there was an explosion at the rocket’s business end only a couple of seconds into the flight. It was followed by an even bigger explosion when it crashed back to earth in a spectacular, but also rather terrifying fireball. • Emily Lakdawalls’s post basically has all the links, including several online observatories which will be broadcasting later. It’s also recommended to follow her on Twitter at @elakdawalla because she will probably be live-tweeting the event. • Universe Today has several articles up, but this one by David Dickinson from a couple of days ago is especially interesting because it describes how the comet encounter actually looks from the surface of Mars – hint: it’s enormeous! • If you want to populate your Twitter feed with science, you can subscribe to my Science & Astronomy list and maybe in addition also to the Spaceflight list. 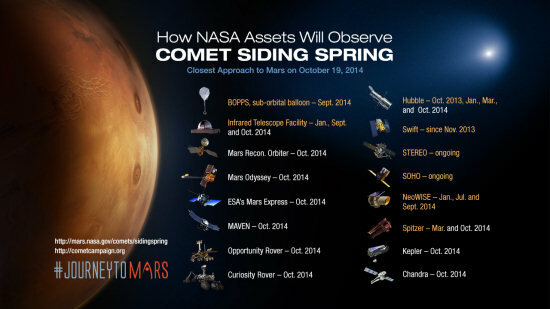 • NASA also has a lot of information on their website, including the infographic what is observing when at Mars during the comet’s flyby.